The Turkish Foreign Ministry strongly condemned Thursday the passing of a motion by Italy's Parliament to recognize the 1915 events in Armenia as "genocide." 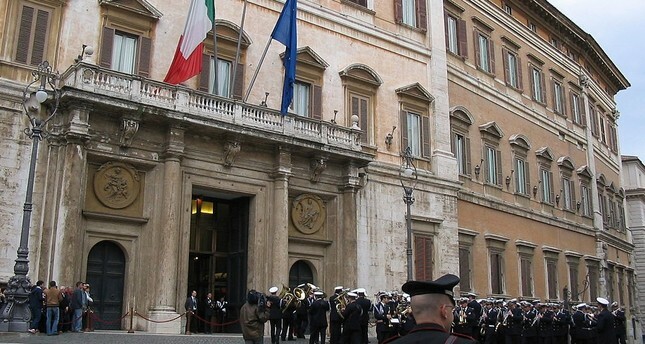 "The motion of the Italian House of Representatives dated April 10, 2019, is a new example of the use of Armenian claims as a tool for domestic political interest," the ministry said in a statement, underlining that the move is "strongly condemned." The ministry noted that the proposal was prepared by Italy's far-right Lega Nord party, stressing that the "allegations being brought up before the elections or in the context of opposition to Turkey clearly reveals the political nature of these allegations and that they are inconsistent with the historical facts." "These efforts are not only beneficial to no side but also stonewall the way for good-faith initiatives," the statement added. Foreign Minister Mevlüt Çavuşoğlu said on Twitter Thursday that the Italian Parliament's motion is null and void and added: "It is unacceptable that the Italian Parliament has become an instrument of the game played by the xenophobic Lega party that is seeking votes for the European Parliament." "We strongly condemn the Italian Parliament's most recent attempt at distorting and politicizing our nation's history," Turkey's Presidential Communications Director Fahrettin Altun tweeted earlier. He said the Italian Parliament's move is "unproductive, hostile and deplorable." "Instead of attacking each other's memories, we must all work together to ensure that truth prevails over fiction," Altun added. Turkey's presidential spokesperson also slammed the passing of the motion. "The so-called genocide decision of the Italian Parliament ignores historical facts and sows new seeds of hostility," Ibrahim Kalın said on Twitter. He added that the decision "fuels political populism." Ömer Çelik, the spokesperson for the ruling Justice and Development Party (AK Party), also condemned the motion, saying Italy is being tricked by the Armenian diaspora, which in no way wants normal relations between Turkey and Armenia. Meanwhile, a bipartisan group of U.S. senators also introduced a resolution Wednesday to recognize the 1915 events as "genocide." "The Armenian genocide is a historical fact and not up for debate," said Sen. Robert Menendez, who, along with Sen. Ted Cruz, introduced the resolution. "With this resolution, we honor the millions of victims of this genocide, remember how they died and pledge that history accurately remembers their deaths," he added. It is unclear when the resolution will be taken up, but a previous effort in 2014 stalled out with the resolution never hitting the full Senate floor after clearing committee. In addition to Cruz and Menendez, this year's resolution has the support of 14 more senators in the 100-member chamber. Successive U.S. presidents have refrained from calling the deaths of Armenians "genocide," but former President Barack Obama adopted the use of the Armenian phrase "Meds Yeghern," or "Great Crime," to describe the tragedy, a practice repeated by President Donald Trump. Turkey's position is that the deaths of Armenians in eastern Anatolia in 1915 took place when some sided with the invading Russians and revolted against Ottoman forces. A subsequent relocation of Armenians resulted in numerous casualties.